Sprawling in over 7 acres of pure lush greenery and surrounded by a thick forest cover and captivating natural fauna and flora, the Dolphin (PG) Institute lies on the outskirts of Dehra Dun. Upon entering the campus, the first thing one notice is a sense of calm amidst a flurry of activities. The peaceful atmosphere and the salubrious climate provide a perfect setting for young minds to absorb knowledge. The institute presents a picture that is full of life and cheerful energy. The lively surrounds and the equally committed approach towards the culture of studies are reflected both by the teachers and the students. “The environment is very different here than the rest of the colleges, you can approach teachers any time you like. I find it a great place to study,” says Shraddha Agarwal, a Masters student. Students come here from all over the country be it Kashmir, Manipur, Nagaland, Bihar, Jharkhand and even from beyond the borders. Pupils from Bhutan, Nepal, West Africa and other countries intermingle freely and enhance their socio-cultural ties with the global doctrine of nature forming the backdrop. 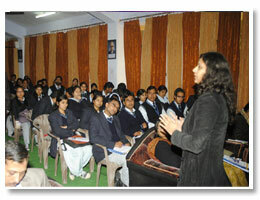 “I quit an institute in Delhi to come and study here as my friends highly recommended it. I love the course I am studying here and my classmates help me over the language problem. The teachers too are very helpful,” says Ingrid Denadi, a Bachelors student from Benin, West Africa. The institute is a vastly reputed for providing quality education to the young students and to develop them as professionals in biomedical and natural sciences. It is accredited by NAAC up to 2016 with CGPA of 2.81 on four point scale. The annual result of the college is generally much higher than the university average. Drop out rate is insignificant. Our strength is a team of highly qualified, dedicated and experienced faculty appointed as per UGC norms, from many renowned universities, medical and paramedical colleges of repute. In order to achieve excellence in specialized fields experts for guest lectures are invited by the various departments on regular basis. Besides these, there are a number of outstanding senior scientists in the faculty of the Institute to provide guidance to students in modern research. The faculty is regularly guiding students for the PG dissertations from many other institutions as well, Ph.D. programmes. 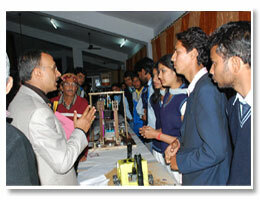 The faculty is conducting a number of major Research projects and publishing books and research papers regularly. They are also members of PAC and BOS of various Govt. and Non Govt. organizations.